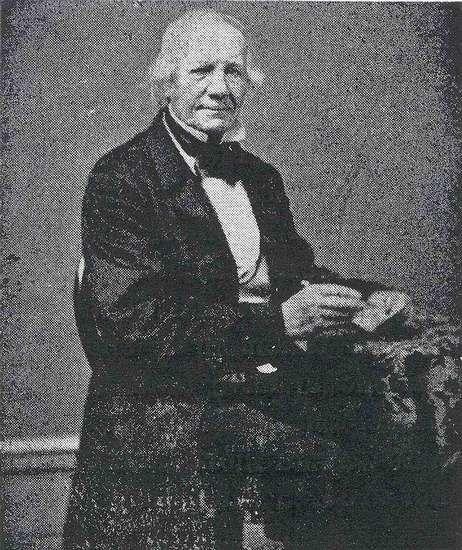 Thomas H. Gallaudet, Painting by George F. Wright in 1851. Thomas Hopkins Gallaudet was born in Philadelphia, Pennsylvania on December 7, 1787. He is said to have been in “poor health” most of his life — he suffered from frequent nightmares, “nervous attacks”, and a deep sense of inadequacy. This didn’t keep him from leading a life full of commitment to moral, religious and philanthropic duty. He was an outstanding student at Yale University, graduating at age seventeen first in his class. He went on to Andover Theological Seminary, but because of his nervous disorders he felt he couldn’t accept a post as a minister, and instead returned to live with his parents, who had moved to Hartford, Connecticut. In Hartford, Gallaudet met a young deaf girl named Alice Cogswell, the daughter of his neighbor, an eminent surgeon named Mason Fitch Cogswell. Gallaudet attempted to teach Alice to read, but his limited success was frustrating. Alice’s father was actively trying to establish a school in Connecticut for deaf children. The best-known educators of deaf people at the time were the Braidwood family, who had schools in London and Edinburgh, where they charged high fees for their instruction. A small number of well-to-do American children had gone to England to study with the Braidwoods, and Cogswell persuaded Gallaudet to go to Britain and investigate their educational methods. After much worry about whether his health was up to it, Gallaudet agreed. The Braidwood method emphasized teaching deaf students to speak as well as read and write. Gallaudet found the instruction rigid and unproductive. The Braidwoods offered to take him on as an apprentice and teach him their methods, but he had to promise to keep these methods secret and not share them with others, and Gallaudet refused. While in Britain, however, he encountered a man who would give him a new vision, and set the course for education of the deaf in America. The man was Laurent Clerc, a graduate of the Royal Institution for the Deaf in Paris. Clerc and his teacher, Abbé Roch Ambroise Sicard, had come to London to give public demonstrations of their methods, and Clerc’s abilities amazed Gallaudet. Sicard communicated audience questions to Clerc through sign; Clerc wrote out fluent and complete answers on a chalk board. Sicard generously invited Gallaudet to Paris, promising to teach him his methods at no charge. The French model — a free public institution where sign was used by teachers and pupils, and oral speech was unimportant — was what Gallaudet would bring back from Europe. Even more important, he brought back Laurent Clerc, who volunteered to come to America and teach. With Clerc as a living example of what education could do for a deaf person, Gallaudet and Cogswell were able to persuade the Connecticut Legislature and rich private donors to fund the establishment of the first public school for instruction of the deaf in the United States — the Connecticut Asylum for the Education and Instruction of Deaf and Dumb Persons, later renamed the American School for the Deaf. Gallaudet was principal until 1830. In 1821, Gallaudet married a former Academy student, Alice Fowler. She became a prominent figure in the deaf community, and their son Edward would found the Washington school that would become Gallaudet University. Gallaudet spent the last twenty years of his life in numerous social and philanthropic activities. As a Christian minister, he believed that the greatest benefit of education for deaf people would be the ability to read and study the Bible. He wrote in the first annual report of the Connecticut Asylum that with education deaf people would “be brought to a knowledge of the truth that is in Jesus” and would “finally be found among the redeemed of the Lord.” He died in 1851. Reference: Disability History Museum Staff, “Rev. Thomas Gallaudet,” Disability History Museum, http://www.disabilitymuseum.org/dhm/edu/essay.html?id=37 (January 29, 2014).